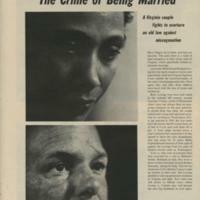 This document shows an article that was originally published in Life Magazine on March 18, 1966, written on the Lovings following the Virginia Supreme Court decision to uphold the 1924 Act to Preserve Racial Integrity Act. The case surrounds the story of Richard and Mildred Loving of Caroline County, Virginia. On June 2, 1958 Richard and Mildred Loving traveled to Washington D.C. to obtain a legal marriage and returned to Virginia where interracial marriages were illegal. On July 11 of the same year, a warrant for their arrest was made stating they broke the law by obtaining a marriage license. They were found guilty and were told to leave the state of Virginia. They could only return to visit family if they traveled separately and were not in the state at the same time. Seeking a way to live in Virginia together, Mildred Loving wrote a letter to the United States Attorney General Robert Kennedy, asking for his help. Kennedy then referred Mildred Loving to the American Civil Liberties Union (ACLU). In June 1963, Bernard Cohen was on the case and a few months later Philip Hirschkop, a lawyer who had been working on civil rights in Mississippi, joined the case. The case was appealed all the way to the United States Supreme Court, where Cohen argued that the Racial Integrity Act violated the Lovings’ rights to due process. On June 12, 1967 the rule in Loving v. Virginia was unanimously in favor for the Lovings stating that the Act to Preserve Racial Integrity Act was a violation of the 14th amendment. 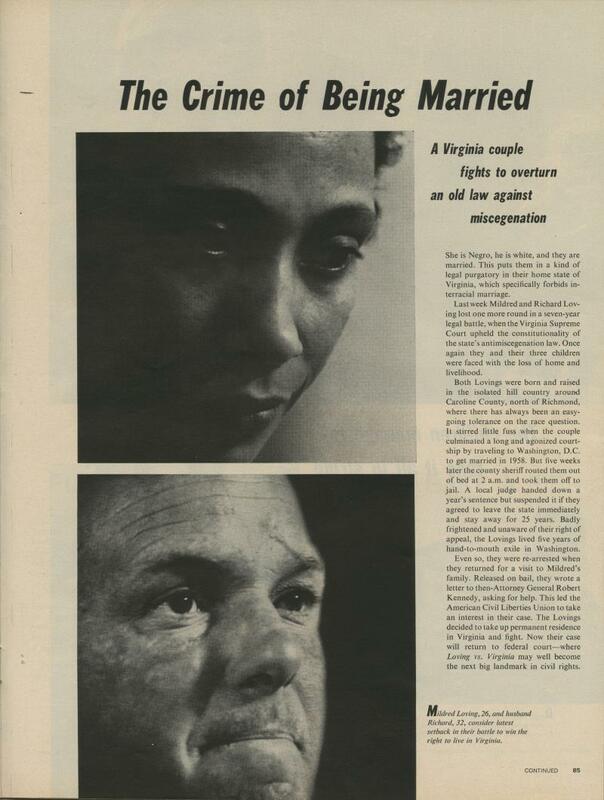 Citations: Newbeck, P., & Wolfe, B. Loving v. Virginia (1967). (2014, June 16). In Encyclopedia Virginia. Retrieved from http://www.EncyclopediaVirginia.org/Loving_v_Virginia_1967. "The Crime of Being Married. A Virginia couple fights to overturn an old law against miscegenation." Life Magazine, 18 March 1966. Photographs by Grey Villet. “ "The Crime of Being Married",” Library of Virginia, accessed September 14, 2015, https://lva.omeka.net/items/show/58. Artistic Exploration: Create a poster or newspaper article showing the U.S Supreme Court's decision to rule in favor of Loving. Current Connections: How is the right to marry the one you love still relevant today? 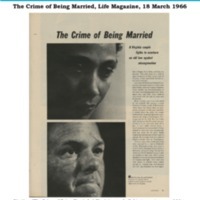 “The Crime of Being Married, Life Magazine, 18 March 1966,” Document Bank of Virginia, accessed April 21, 2019, http://edu.lva.virginia.gov/dbva/items/show/171.